At home or for your event, be sure to read Our Heroes' Tree, a family-friendly, picture e-book that shares the meaning of this event through the story of the very first Our Heroes' Tree. Order the e-book on Amazon.com today! A comprehensive Planning Guide is available for download at no charge. The outline below provides an overview of how to plan your event, along with ideas from participants and templates for ornaments. Download these brand new templates for making decorations for Our Heroes' Tree! BUDGET. Some groups have been successful asking local merchants or organizations to donate goods (e.g., tree, flags) or services (e.g., musical performance). PLAN. Give yourself time to plan and prepare. The recommended duration for Our Heroes' Tree program is one to two hours. Consider variables, such as group size and composition, location, and travel distances, and adjust the time accordingly. DECORATE. Our Heroes' Tree stands tall with American flags, streaming yellow ribbons and bows, and white lights. Participants adorn the trees with meaningful photographs and messages, drawings, and other creative decoration. Check Pinterest: Our Heroes' Tree Program for ideas. ANNOUNCE. Reach your audience using traditional and new media: newspapers, websites, and social media for announcements. ENGAGE. Extend your community outreach based on the unique needs of your organization or community. ENRICH. Some groups invite Veterans to speak, host book readings and signings, and even sponsor blood drives. One creative idea leads to another. For more ideas, check out Pinterest: Our Heroes' Tree Program. McBride Elementary School, Ft. Benning, GA, dedicated Our Heroes' Tree to families, then soldier moms and dads carried family ornaments with them to Iraq. Purdue University's Military Family Research Institute engaged community and military libraries in Indiana, and more than 30 states and a dozen countries to honor Veterans' Day with Our Heroes' Tree. MFRI created educational literature, posters, bookmarks, and a Virtual Our Heroes' Tree via their website: www.mfri.purdue.edu. Currituck BBQ Restaurant, Currituck, NC, honors its local firefighters and police officers with Our Heroes' Tree because many dual-serve in the community and the National Guard and Reserve. At the United States Military Academy, prior to dedicating the inaugural Our Heroes' Tree in 2005, West Point Elementary School invited Stephanie Pickup to read her book, The Soldier's Tree, to its classes. 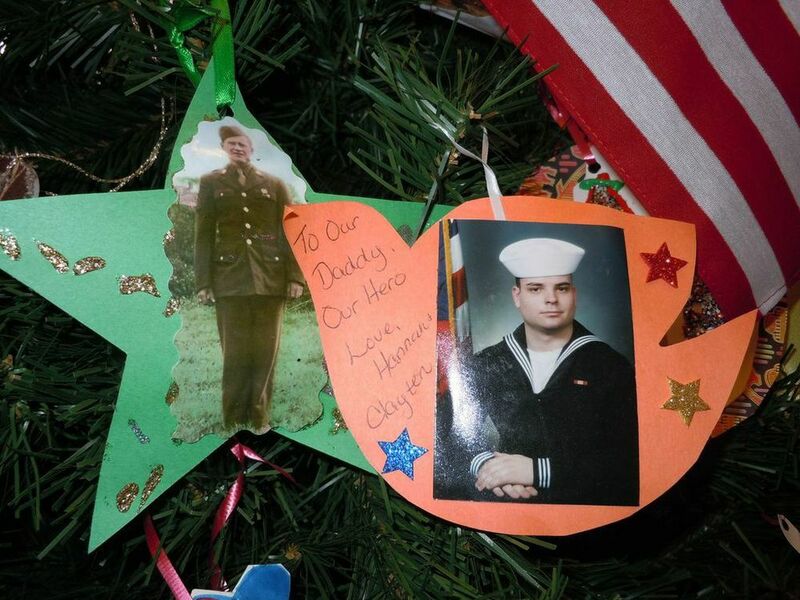 Princeton (West Virginia) Public Library received far-reaching community support when they hosted Our Heroes' Tree. 1st Armored Division families in Friedburg, Germany decorated 11 Our Heroes' Tree outdoors with 2,000 ornaments. Morale soared as families watched their soldiers downrange via a large-screen videocast. (Fmr) Rhode Island Governor Donald and Mrs. Carcieri's tradition of hosting Our Heroes' Tree in the State Capitol in conjunction with the Rhode Island National Guard, allowed citizens from all over the State to participate. Schoolchildren received lessons in civics, history, and more.